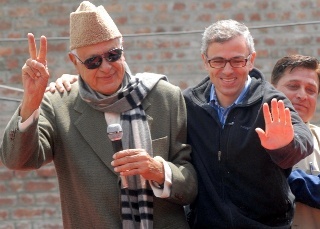 National Conference workers headed by its patron Farooq Abdullah hit the streets in Srinagar today to protest what they called the biased approach of state-owned telecommunications company, Bharat Sanchar Nigam Limited (BSNL). The activists shouted anti-BSNL slogans and torched the effigy of BSNL manager at Lal Chowk to register its protest. “I don’t understand that of all the people in this state, BSNL was sending these messages to Geelani. What the hell. Main kya mar gaya tha,” a fiery Abdullah roared as his supporters cheered in applause. The NC march came a day after the Hurriyat Conference led by Syed Ali Geelani warned BSNL to desist from sending lewd messages to costumers in Kashmir or face a boycott. Abdullah mocked BSNL for its “attitude” and asked it to bear the consequences of its actions. “You send precious things to people who don’t value it, now bear the consequences,” he said.